The South Korean government released an amendment to the national roadmap for reducing greenhouse gas emissions. The table below shows the revision. However, there are substantial criticism about the amendment. Greenpeace and the Korean Federation for Environmental Movement, two of the most powerful environmental advocacy groups already released their critical statement about the revision. 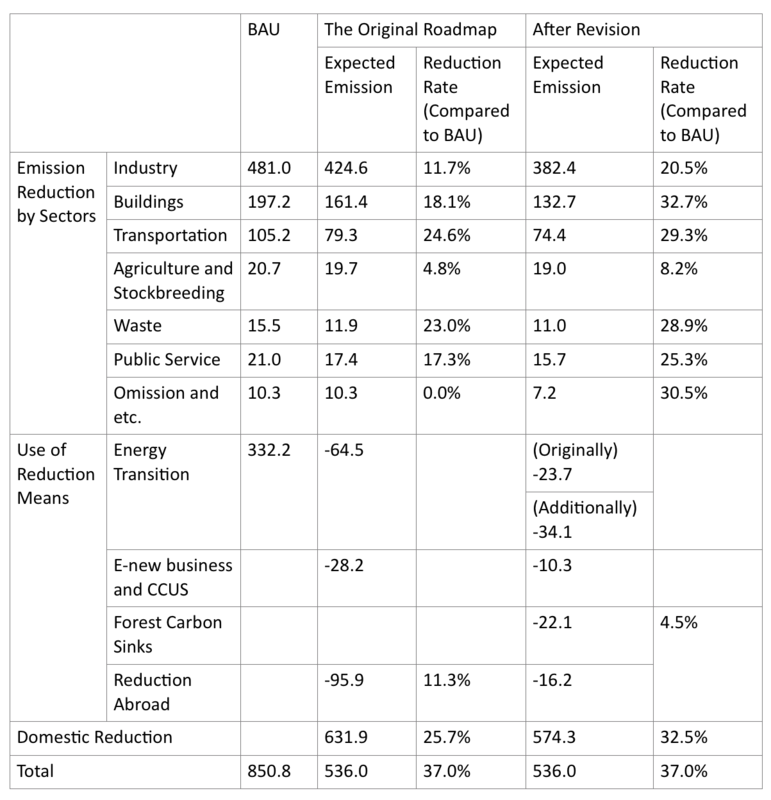 The greenhouse gas reduction roadmap plans to reduce emissions to 536 million tons by reducing emissions by 37% from 850.08 million tons in 2030 (based on the existing BAU project). The government plans to utilize the reductions in bilateral climate change cooperation projects. One of the major critical problem in the amendment is the forest sink. This is the amount of forests that are absorbed naturally, and the international community has not provided much guidance for calculating its impact on greenhouse gas emissions. It has become difficult to acquire carbon credits in the overseas carbon credits market or reduce them through overseas cooperation projects. The government has decided to reduce its overseas reductions to 1.9% (16 million tons) and increase its domestic reduction to 32.5% (276 million tons). As a result, the amount of reductions that Korean companies should bear has also increased from 57 million tons to 99 million tons. Emissions companies that received 100% gratuity are obliged to purchase the deficit starting this year, so the cost burden of the corporation increases. Industry estimates that an additional burden of 4.5 trillion won will be added to the purchase of carbon credits every year. In fact, the price of carbon trading has skyrocketed after the government announced the amendment of the 2030 National Greenhouse Gas Roadmap. The price, which stood at around 22,000 won per ton, rallied to 27,000 won on June 29, right after the government announced the amendment. It looks like the South Korean government focused only on transferring implementation of reductions that were classified as overseas reductions into domestic reductions. However, the methodologies are still vague without concrete adjustment among industries while business sectors have deep concerns about the uncertainties. South Korea’s current decision on its mitigation policies seems to be focused only on transferring implementation of demission reductions that were classified as overseas reductions into domestic reductions. The methodology for making these transfers is vague and needs to be clarified. We would like to encourage MOE to improve the guidance it provides businesses and others on how these transfers should be accounted for. Climate change is real, and what governments do matters. Help us work with key stakeholders globally to ensure continued support of the The Paris Agreement.